That’s How You Open the Emmys? 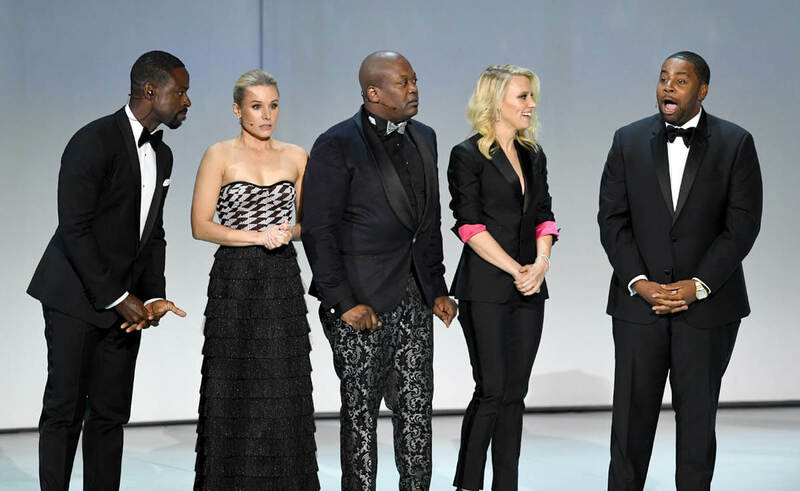 Credit where credit is due – the way the nominees, then presenters, then winners were announced was so inexplicable and utterly confusing that it probably made people pay a lot more attention. 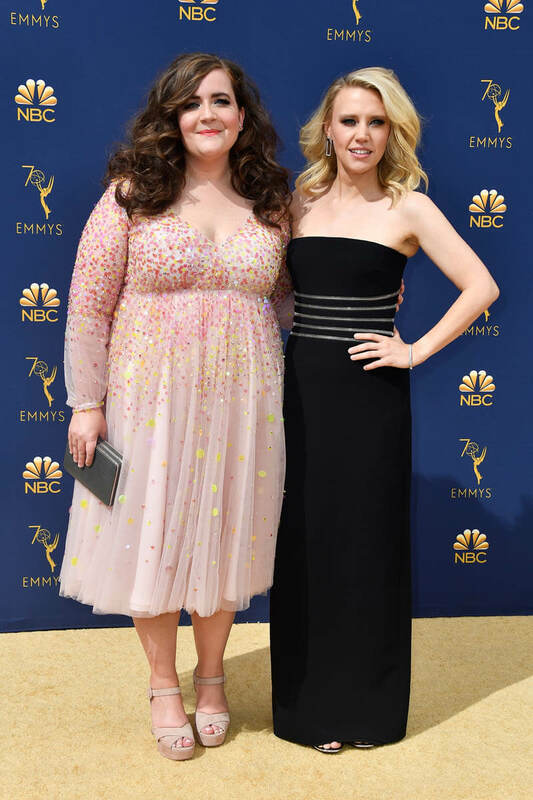 To the point where, when Kate McKinnon and Kenan “Holy Sh*t He Looks Good” Thompson came out, people actually thought maybe Che and Jost bailed, or couldn’t make it, or something. In my opinion, they were sandbagging – and not well. 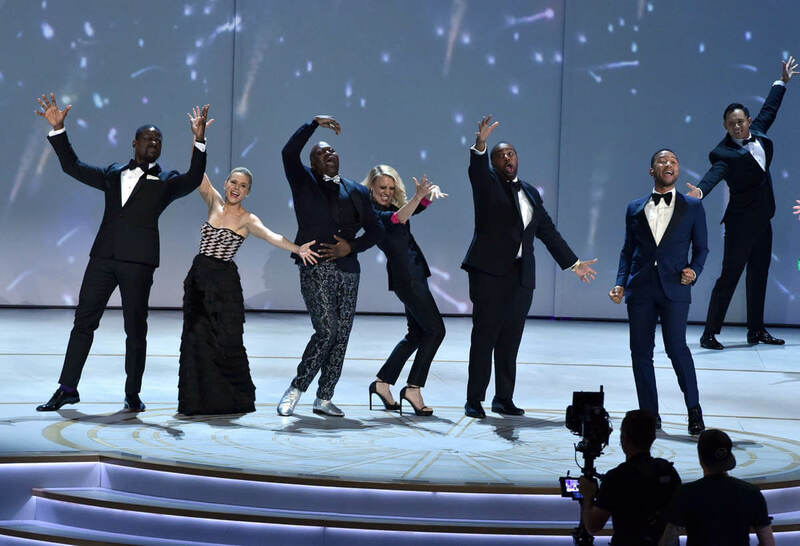 Because even though Kate and Kenan and all the other K names (well, Kristen Bell and Sterling K Brown and Tituss Burgess) busted their asses to sell that dumb song about how the Emmys, with their diverse nominees, ‘fixed’ the lack of diversity on television, it was just… kind of dumb. It wasn’t funny-funny, more like ‘heh’ funny at the verrrry best. Andy Samberg riding down on a moon to announce that he was scared, which could only have been conceived of by a bunch of stoned writers in a room, was heh-funny, sort of. Sandra Oh’s line was cute enough because her parents were adorable – but come on. Look, I’m here for cheesy whenever I can get it, and I can even like dumb if possible. But the ‘one of each’ dancers didn’t work because they under-explained the joke; if you’re gonna do it you have to lean in and have them say what or where they represent like it’s the Miss USA pageant – and the shot was too fast anyway. The Ricky Martin bit? That had the potential to be mega-cheesy, but it went nowhere at allll. 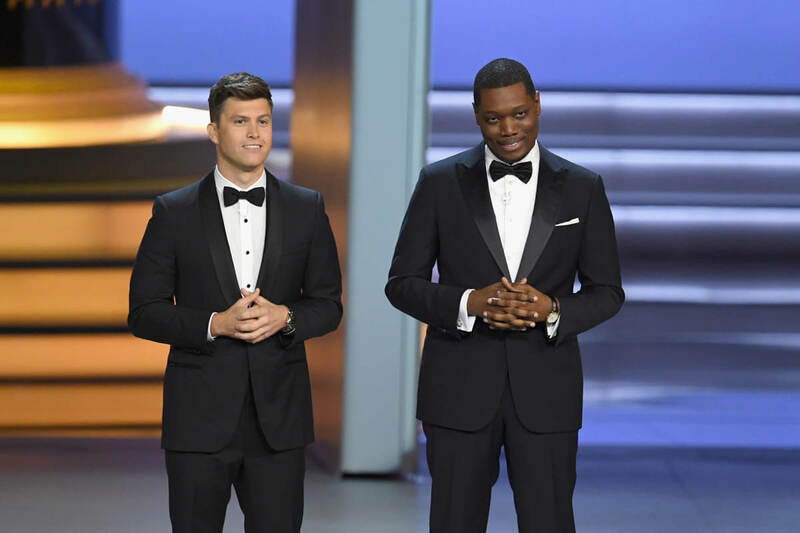 I don’t put it past Colin Jost and Michael Che, who are smug about how much smarter and funnier than us they are, to have thought they would seem hilarious and dry after that, but they just looked like someone let the air out of them. 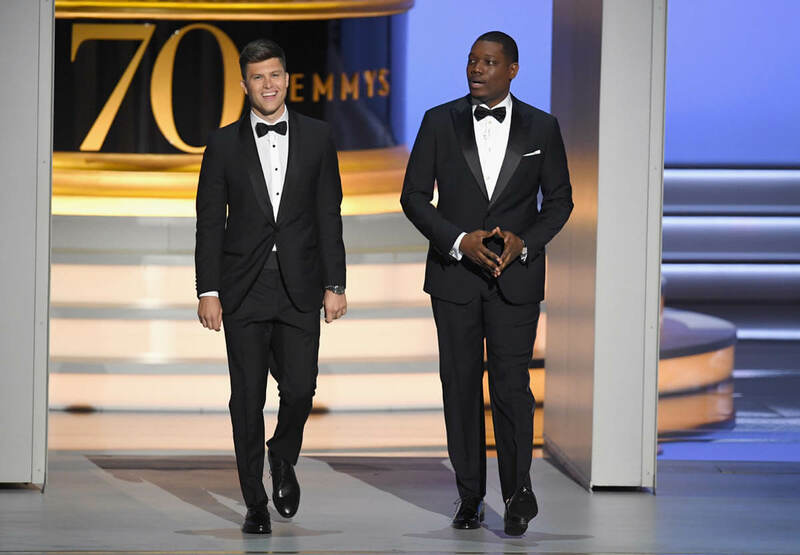 The jokes weren’t the dry punchlines they pull off on Weekend Update, and most importantly, their saving grace on that show is that they look like they’re having so much fun. Nobody was having fun here, not in the opening monologue and not in the annoying video segments. Just… snoooozy. Oh, and while we’re on ‘we solved it’? According to some cursory research, the writing team was made up of three women and thirteen men, which is still f-cking dismal. If any of those men were reading this, of course, they would RUSH to tell me that there was ‘additional material by’ two other women, so… still dismal. 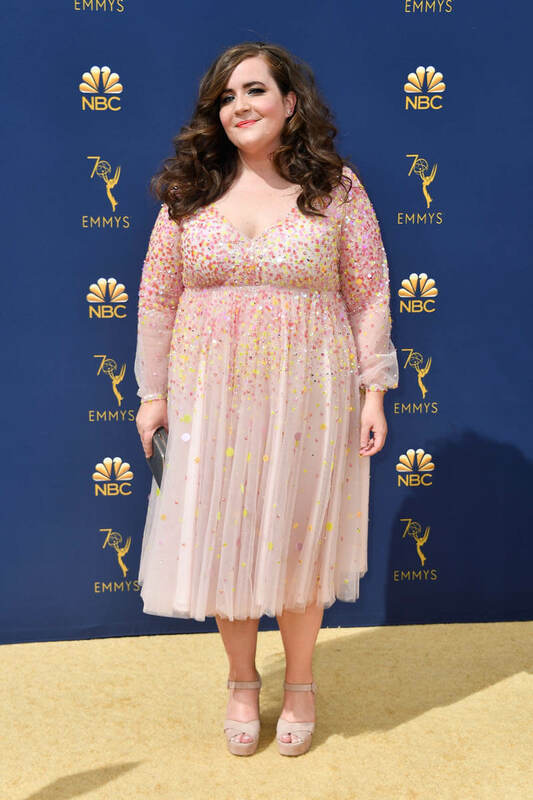 The worst part is, obviously this is a Lorne Michaels joint and all the SNL players got a lot of face time (with the exception of Aidy Bryant, whose awesome dress we barely got to see). But Kristen Bell has been KILLING IT on The Good Place and wound up a total also-ran, and Tituss and Ricky Martin got a modicum of a moment each, and it didn’t even have the grace to be so bad it was shocking. It was just sort of blandly competent… which set the tone for the rest of the night. ...On with the show? That’s our job now.